Man Arrested for Meth at the Kids Playground, LIVINGSTON, February 20, 2017 - At approximately 4:30 pm on February 19, 2017, the Livingston Police Department Patrol Division were conducting routine patrol. 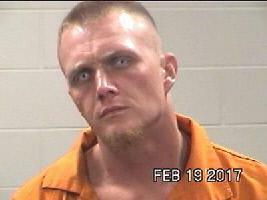 While patrolling Matthew’s Street, officers observed Grant Earl Grayson, 29, of Livingston. The officers were familiar with Grayson and were aware of an active Felony Warrant that had been issued by Livingston Police Department for his arrest. The officers made contact with Grayson who was taken into custody without incident. While inventorying Grant Earl Grayson’s property Officer located a empty syringe and a small brown glass cylinder containing a crystal like substance which field tested positive for the presence of methamphetamine. Grant Earl Grayson was charged with possession of a controlled substance in a drug free zone (kids playground), a felony. Emails from witnesses at the scene stated that there were kids at the playground.